Tragedy defines the brave and at the same time it also exposes the charlatans. History, more than anything, teaches us a very vital thing. If you are unsure of the clowns and the traitors within then closely mark their behavior during the time of tragedy. You don’t have to employ much of your efforts. The faggots will expose themselves in the process. The recent earthquake in Nepal and the expected precedence not only has exposed many such impostors but also told us, how, people who mean business and are serious about helping others, actually act rather than blabbering around. Before debating the present, let’s go back to history a bit. What do you see in this picture? No, not Narendra Modi doing a Bhatta Parsaul act of Rahul Gandhi behind a bike for photo up. If you are confused, it is not his photo of biking around Kathmandu to supervise the ongoing relief work either. This photograph dates back to a decade and half. Our own Kutch was badly hit by an earthquake during 2001. 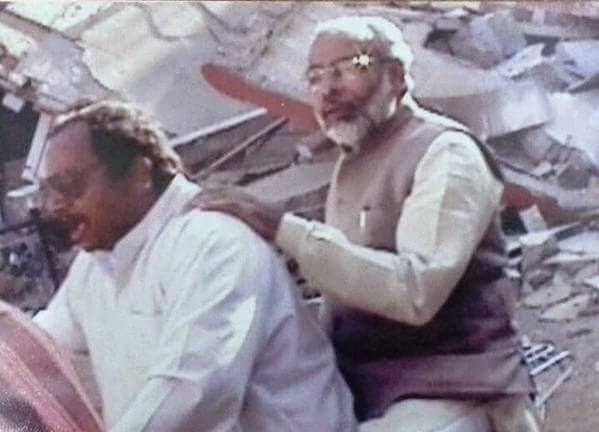 The man in Narendra Modi was installed as the new CM of the state and asked by Vajpayee ji to monitor the relief work. His appointment to the post had its reasons. Narendra Modi was well known within the circle for having a no nonsense attitude towards responsibilities. His skills of organizing relief activities had a fair share of conviction. Atal ji not only installed Modi as the new CM but also gave him a tough assignment to make sure that the last affected person in the quake gets the desired help. Not that Modi was the first choice of Atal ji. Other stalwarts simply refused to venture into such a challenging territory where there is everything to lose. But the fighter in Modi accepted the challenge as another opportunity to serve the people of his state. String by string; brick by brick; he worked tirelessly for months to help each and every affected soul. A week after the massive quake, NaMo spent an entire day in the great ran and vowed that he will remake the whole Kutch to its previous glory or may be beyond. Rest is history. Today you go to Kutch and you can see the hard work of this man. Ask the people who survived that nightmare of an event. You can easily find the warrior in NaMo in their words. You can find his efforts where he made sure that his people get the required help during the time of adversities. This is called standing tall among the ruins. No ifs, no buts, no political mileage, no grand standing for photo ups. Simply pull up your socks and deliver when it matters. When Modi said – we will wipe the tears of Nepal, there wasn’t an iota of doubt in his words that he means what he is saying. This is a true leader called Narendra Damodardas Modi for you. What do you see in this picture? You may get the impression that; someone is flagging off as if it is a freaking Himalayan Car Rally. But it actually isn’t. It is a flag off ceremony to kick start a merrymaking event like, hold your breaths, sending relief material for the millions stranded because of Mother Nature’s fury. Even the loathsome Sekhar Gupta agreed to sponsor it. In the history of mankind, perhaps Congress did what was never done before. 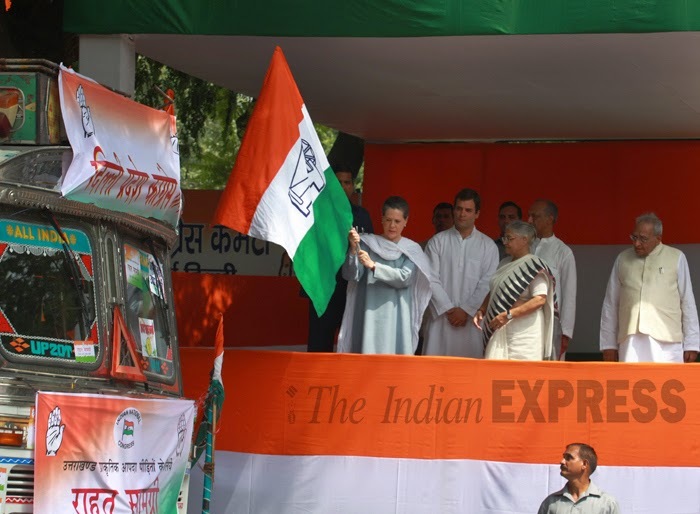 Just to give the Chinese Gandhis a photo opportunity, they organized a flag off ceremony to send 3 trucks full of relief material to the Uttarakhand flash flood survivors. Surprised? Don’t be till I give you the timeline. On 18th, Uttarakhand was devastated by flash flood. Lives and lifelong savings were washed away in 10 minutes flat. True to his reputation, Rahul Gandhi was enjoying his vacation (in Bali or something) yet again when the country was braving a worst kind of disaster. The government of the day kept on sleeping when our own people were dying. By 24th the government woke up from its slumber. After all switching to real time governance from scam-a-day routine takes time. So that should be fine. After full one week, the government realized that, people in Uttarakhand actually need relief material. How nice of them, no? Promptly people from the ministry did their bit of aerial survey to ascertain the magnitude of the damage as if that matters. Once the leaders found the damage worth of attention, the government announced some kind of relief. But our media was idiot as usual. By then, the Arnavs of the world were questioning the absence of the great Rahul Gandhi. So Rahul Gandhi had to be rescued first. People in need in Uttarakhand can wait. To show to the media and the citizens that Rahul Gandhi really cares for the needy, the relief material carrying trucks were asked to wait till the prince arrives from his Bali escapade. Promptly stages were erected, so as Shamianas of colorful hue were properly placed to give the stage a designer look. After 3 days of waiting, the prince arrived and headed straight to the flag off point to join his mother who was already there to grace this momentous occasion. Flag offs were done with clicking of millions of pictures to grace the front pages of various paid dailies the next day. What will you call this? Shamelessness or Godlessness or both? People were dying while the Congress louts were busy decorating a mule to appear like a horse. Is this what a responsible government does during the time of adversity? Was it a government for the people or for the Chinese Gandhis? Now, what this picture tells you? I admit, the last one at the right is morphed and we can leave that. What about the first three? This is another farce of a political outfit called AAP. Yes, the same AAP that let a man die during their rally because a blabbering motor mouth called Arvind Kejriwal was more important. They simply watched someone die because AK was blabbering at the same time. But that is hardly a surprise for me. Because the AAP as a party is full of third rate opportunist clowns. Someone dying is none of their concerns. So when the party’s Twitter handle tweets to let know that, they are eagerly waiting for anyone who is in need of help only confounds to their nonchalant attitude towards the people who have voted them. Little did these jokers know that, people when dying, look to save themselves and their dear ones. Last thing they can do is to call or tweet these buffoons for help. Someone who really wants to help would jump in to help, rather than doing arm chairing and pledging to help if cry for help comes. This is called making a comedy of those who were dying. It is very close to shedding crocodile tears or worse, laughing secretly on someone else’s misery. Same as the act of these very clowns that they were doing for the Gujarat riot victims. Where helping the riot victims cause was not the intention but accumulating political brownie points were. People who want to help don’t wait for opportunities for grandstanding. They simply get up and rush to help. Exactly what the RSS chaps did. They never did tweet about their open pledge. They simply rushed to Kathmandu with relief material and taskforce for physical assistance to the already engaged disaster management patrons. Look at our army and air-force. They never tweet their crocodile tears either. They were at the ground zero within hours of the tragedy. But then, people of Delhi deserve such arm chair clowns, who are best at procrastination. For them doing their job is least of their priorities. After all people call them #AAPTards not without a reason. But look at the cacophony, the jerks in Congress who even don’t know how to keep silent during the time of misery. Misery of anyone after all is misery. It is Nepal now which could easily be us next time. Narendra Modi, unlike the mute button, acted within 45 minutes of the tragedy. He directed our NDRF personnel to rush to the spot immediately. He also directed our air-force to remain standby and they were also pressed into service by 6:15 PM in the evening. In contrast, these louts who are now running around funny were waiting for Rahul Gandhi to return so that they can start their mockery called relief work; and that too when our own were dying. The world is hailing the intention of our beloved PM while the sycophants are busy equating the importance of helping someone who is dying with the farmers of India; again when the plight of the farmers is because of their own fractured policies of decades. Our media morons are even not far behind. These jerks rush out to defame RSS at the slightest opportunity and compare it with MIM or Al-Quaida but never would tell now, who is fighting it out at ground zero to save innocent lives. Who is doing selfless service? MIM? Al-Quaida? Congress? SP? BSP? TMC? JD(U)? or RSS? Hope this tragedy has opened many eyes and the thugs are exposed like never before. People, please take a note of these charlatans on your notebooks and make sure their political careers are ruined when they next come to you for their votes. 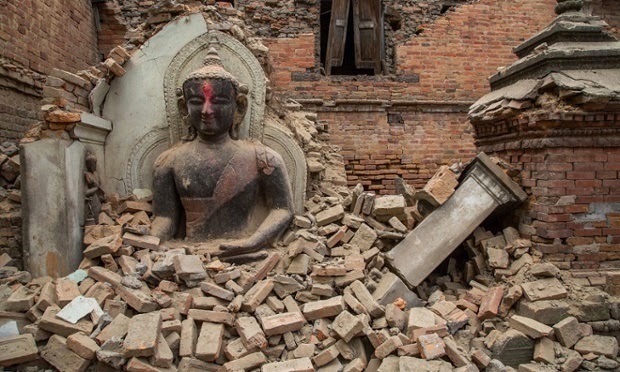 P.S – With a heavy heart, I can only pray for the dead and the survivors of Nepal. We may not bring the dead back but we will make sure that your pain is relieved a bit. As my priminister said and I am proud of his words – we will make sure that we wipe out the tears of Nepal, even if that requires all the force of the world. Great article!! Everyone in India with an iota of basic sense knows the true colors of con-gress, terrorists like mim, sp , tmc, jd(u) and other buffoons. 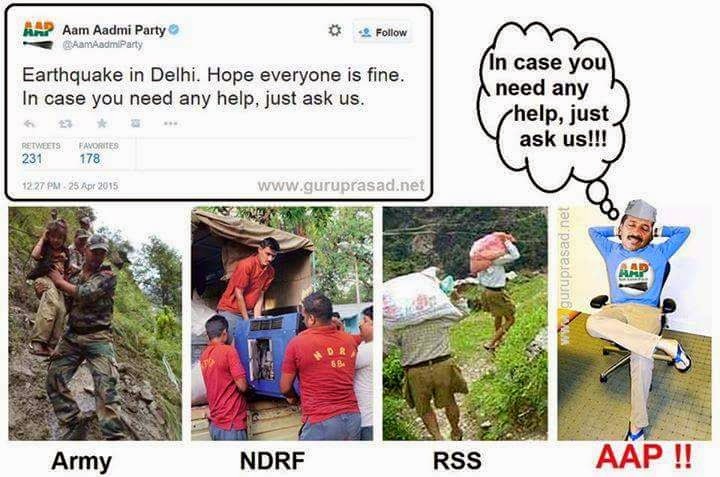 Indeed RSS has reached ground zero without creating hue and cry over the social media but so has the SGPC and Delhi Gurdwaras who have been sending > 1 lac food packets every day. Sikhs have always helped the needy but have been the most discriminated against. Hope patriotic Indians like Modi ensures Sikhs are given their due credit. Good post. You forgot to mention that the trucks to Uttarakhand stopped halfway and sold off the "relief" items because they weren't given enough money for fuel by Sonia Mata and when they contacted local Congress office nobody responded!! Missionary Vultures who were licking their lips at the juicy opportunity to prey on the devastated souls and further their conversion objectives in the name of relief work. This should debunk the widely held myth that Christian missionaries are doing some genuine humanitarian work. Fact is, in their world there is no such thing as free lunch. Such large scale calamity is seen as an opportunity for them to further their vested interests. Its clear that RSS / Baba Ramdev (the favourite punching bags of our missionary controlled media) did geniune relief work at ground zero, and that too without any vested interests/hidden agendas. Where are the left liberal pseudo 'sick'ulars who were crying foul at the plight of Gaza war victims and holding candle light marches ?? For them Hindus (read non-belivers / Kaafirs) are not humans worthy of any rights ?? Their hypocrisy and double speak and shedding crocodile tears in the name of human rights clearly stands exposed. Attitude of the so-called peace loving religion. Read Owaissi's comment on this calamity- according to this retard, its Allah's punishment to non-believers (Kaafirs). But when such things happen to their own ilk, they can readily take any help/relief from the same non-belivers/ Pagans. And ofcourse expect "secular" attitude from others - something they are not seen reciprocating with during this hour of crisis. What an article! Thank you very much for putting the real picture in front of others. The shameless Congis need to be exposed. They behave like they are kings and the rest are there to serve them only. One post on RG please. Whenever he opens his mouth....saying your PM again n again..shows his hatred towards others and adamant behavior. 1. u said about owaisi, plz attach the link from where you had read. if it is just guessing work then u need to apologise in the blog. 2. for your kind information on the day of earth quake, ramdev was present there and in one tv clip he had donated blood along with his nepali friend. now he has left nepal and his bhakts are searching him. confirm this with ramdev he is in haridwar now. Just go through Craig Winn's " The Prophet of Doom " and every one will have a taste of what The Prophet and Islam advocate and what the Terrorists ( quite very coincidentally 99% of them are Muslims and the minuscule percentage of Non-Muslim Terrorists took to terrorism for causes other than Religion ) follow verbatim ! ISIL was not there when the book was written and what the ISIL Cowards do now is the same that was indoctrinated in Islam ! Try to read " Tea with Terrorists " co-authored by Mr.Winn ! If you still feel that you can bear with that unbearable and repulsive Holy Literature , just visit the website " Barenakedislam.com "
I can understand the psyche of an Islamic Terrorist and his belief in his religion but those Left , Liberal and Pseudo-Secular apologists should be dealt with sternly ! To start with , the ISIL should teach Teesta Setalvad a fitting lesson for denigrating Holy Islam by tweeting that ISIL got its inspiration from a polytheistic pagan religion like Hinduism drawing parallels with the Goddess Kali an the Sudarshan Chakra and ignoring the dogmatic Holy Qur'an ! There was another earthquake on Tuesday, 12th May. But this time Indian government is cautious about sending Army and NDRF to Nepal. Rajnath Singh said that these agencies are kept in 'ready condition and will go to Nepal only if requested. Obviously, this is because of the unnecessary/ artificial fear among local Nepalese authorities that India will take away all the credit for the relief work and intimidate local relief effort. Thankfully, they are not like people of kashmir who pelted stones at Indian armed forces (helicopters) when they took relief material to them. We gave our 1 day salary towards Jammu and Kashmir flood relief fund (may be because we consider Kashmiris as our own countrymen; Nepal is different country technically) and so far nothing towards Nepal tragedy. Still the sad part is that some methods/ reasons evolve out of nowhere to break Hindu unity, despite the fact that India has never looked to widen its geographical borders.